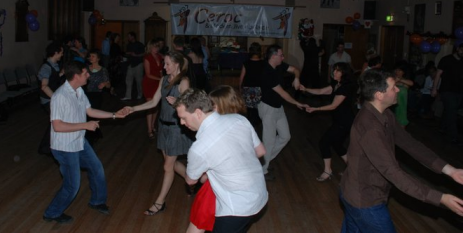 Originating from the UK, Ceroc is a fresh new way to dance to modern music, incorporating elements of other dance styles as diverse as Salsa, Swing, Rock'n'Roll, Jazz/Funk and more. Ceroc is the easiest dance to learn - it's designed both for first-time dancers with "two left feet" and experienced dancers alike - but best of all Ceroc is a fantastic place to meet and get to know people while you're learning to dance with them! Our classes are relaxed and friendly, and we focus on giving you the skills to dance freestyle in public, choosing moves that suit you as you go. As well as our weekly group classes at locations around Adelaide we also run workshops, teach group routines and organise regular social dancing nights and other special events. Keep an eye on the sidebar and events tab for more details! For those of you who are getting married, we specialise in teaching bridal dances to wedding couples - so you can add that little extra something wonderful to your special day. We also offer other private dance lessons for individuals, couples and small groups. If you haven't been to a Ceroc dance class before, don't just sit there - come along and give it a go! Dancing is one of the most enjoyable and rewarding ways to spend your time - and Ceroc could be exactly what you're looking for! 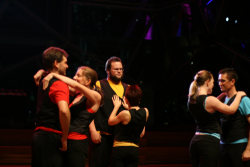 Ceroc & Modern Jive Adelaide offers group classes in Adelaide each week. Doors open at 6:50pm, and start with a beginner class at 7 to get you on the floor. There's plenty of freestyle dance time, so make sure you ask everyone for a dance! Your Wedding Day is one of the most important days of your life. And your bridal dance is one of the most remarkable moments that you and your guests will remember for years to come - so why not let Ceroc and Modern Jive Adelaide help make it even more special? I have a lot of respect for your teaching style, you are very clear with directions, casual in your delivery, yet detailed when the need arises. Your ability to showcase the female steps and moves, is a testament to your committment to teaching excellence. There is no reason that Ceroc & Modern Jive Adelaide, under your leadership can't be one of the best dancing schools in SA.